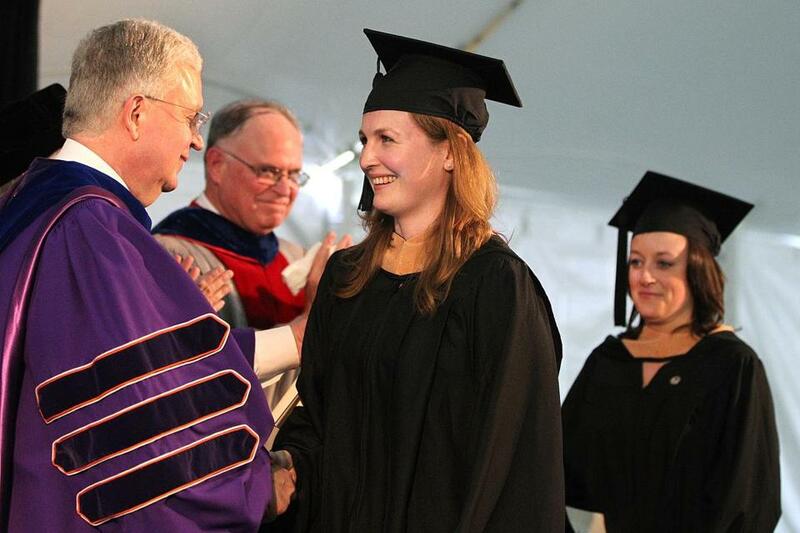 Marathon bombing victims Brittany Loring (left) and Liza Cherney received their diplomas during the BC commencement. Liza Cherney and Brittany ­Loring were standing side-by-side at the Boston Marathon finish line when shrapnel tore through their bodies, leaving them hospitalized for days. On Monday, the 29-year-old close friends, still with some visible wounds and bandages, came ­together once more to proudly walk across the stage to receive diplomas from Boston College’s Carroll Graduate School of Management. To the sustained applause of classmates, they marched without crutches, a goal they had set. The two were among the 4,395 BC students to receive ­degrees on a sun-dappled day on the Chestnut Hill campus. 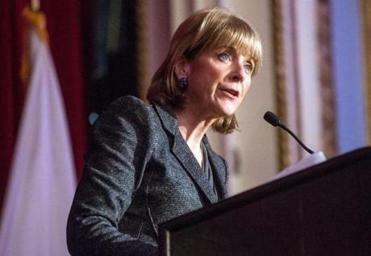 Attorney General Martha Coakley sought to raise awareness of the state’s Victim Compensation Fund, which could aid people affected by the bombings. “Be successful, be well, be happy; above all, be yourselves,” Kenny said in his 23-minute ­address inside Alumni Stadium. He also praised Boston’s ­response to the attacks. He earned a standing ovation from the class of 2013, ­assembled on the football field, and the estimated 20,000 guests who filled the bleachers behind them. School officials said past BC commencement speakers have rarely received standing ovations. Kenny, who was also awarded an honorary doctor of laws degree, did not address the controversy that has swirled recent­ly over his appearance at the school. Cardinal Sean P. O’Malley boycotted the ceremony, where for decades the archbishop of Boston has given the benediction, over Kenny’s support of a measure that would permit abortions in cases of a real and substantial threat to the mother’s life. O’Malley said US bishops have urged Catholic institutions not to honor government officials who “promote abortion” with their policies. About 40 protesters gathered outside the gates to the campus to object to Kenny’s appear­ance. “This clearly violates the teachings of the Catholic Church. BC is hosting a speaker who violates the school’s own stance,” said Kristan Hawkins, president of Students for Life of America. Few graduates and their families seemed to notice or care much about the controversy and protests. “It’s unfortunate; this really shouldn’t have been made into a political event,” said graduate Peter John Augustinos, 22, of Glastonbury, Conn. Instead, the focus for his family and others was on celebrating achievement. Wearing cap and gown and holding a bouquet of flowers after the ceremony, Augustinos stood alongside his parents, two younger brothers, and grandmother. The family had a lot to be proud of. In four years, Augustinos completed three majors: classics, philosophy, and economics. He has a job lined up with a software company in Wisconsin. He also spoke of the deep ties between the United States and Ireland, forged over centuries by immigration and toil. But both women said they are amazed and grateful for the support they’ve received.